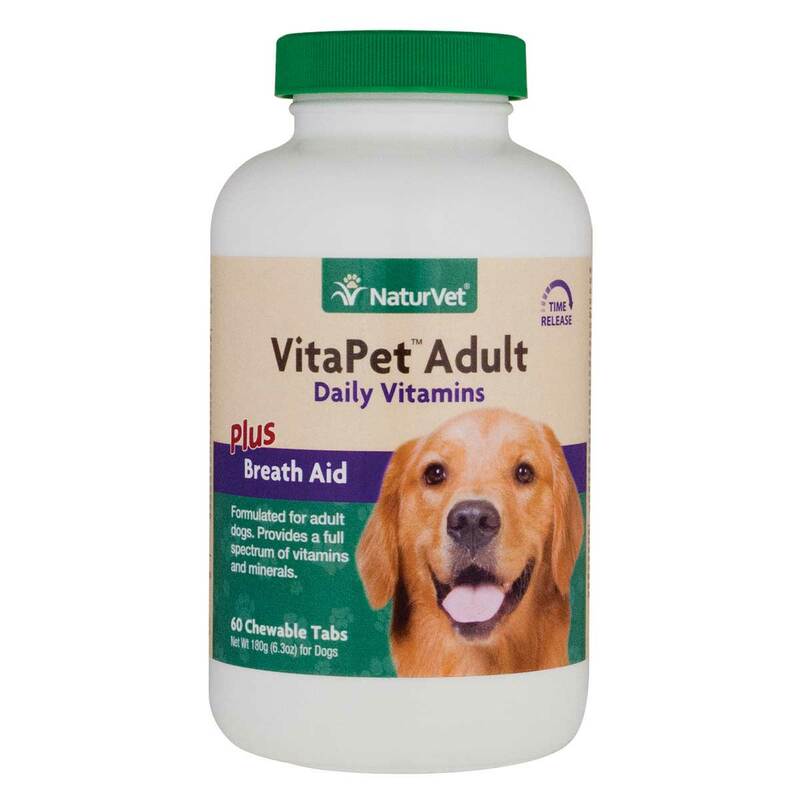 Veterinarian recommended and scientifically formulated to supply dogs with essential vitamins, minerals and nutrients that may be missing in their daily diet. The gradual release provides a balanced absorption of nutrients. Chewable Tablets that taste like a treat!! Maltodextrin, Microcrystalline Cellulose, Dicalcium Phosphate, Natural Flavoring, Brewers Dried Yeast, Stearic Acid, Parsley Leaf Powder, Silica Aerogel, Magnesium Stearate, Ferrous Sulfate, Niacin Supplement, Beta Carotene, Vegetable Oil, Vitamin A Palmitate, Vitamin E Supplement, Zinc Sulfate, dl-Methionine, Riboflavin, Thiamine Mononitrate, Vitamin D3 Supplement, Manganese Sulfate, Vitamin B12 Supplement, Pyridoxine Hydrochloride, Copper Carbonate, Potassium Iodide, and Cobalt Carbonate. Dosage:Dogs under 10 lbs. - 1/2 tablet daily; Dogs over 10 lbs. 1 to 2 tablets daily. For sick, convalescing, pregnant or nursing dogs under 10 lbs. - 1 tablet daily; dogs over 10 lbs. - 2 tablets daily.